"The man with no name is back... the man in black is waiting... a walking arsenal - he uncoils, strikes and kills!" For a Few Dollars More (1965) is the middle movie in a trilogy of Westerns from director Sergio Leone. The film stars Clint Eastwood, whose character is never given a name (though he is sometimes called "Manco," meaning "one-handed," because he does most things with one hand). The movie follows two bounty hunters (played by Eastwood and Lee Van Cleef) who are on the trail of a fugitive known as El Indio. Although the movie features plenty of action, with shoot-outs and other moments of high drama and suspense, the pace is relatively leisurely. The film follows the two bounty hunters separately at first. Manco and Colonel Douglas Mortimer (played by Van Cleef) each target El Indio independently before forming a loose alliance. None of the characters seems to fully trust any of the others, and for good reason: the main characters are each in business for themselves. Alliances shift in surprising ways throughout the movie, producing some memorable plot twists. For a Few Dollars More was filmed in Spain with studio interiors shot in Italy. The U.S. version was released in 1967 with music by legendary film composer Ennio Morricone. 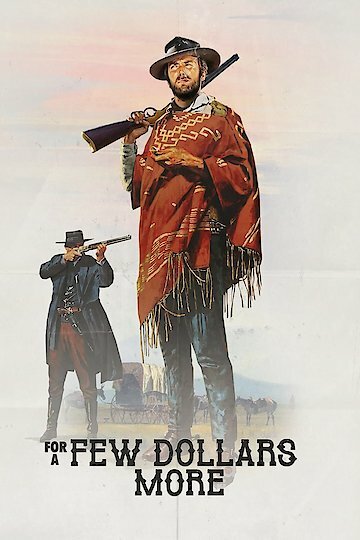 For a Few Dollars More is currently available to watch and stream, download, buy on demand at Amazon Prime, Hulu, Amazon, Vudu, Google Play, iTunes, YouTube VOD online.